Judge Henry Monroe Campbell was born in Ulster County N.Y. on 10 Sept. 1783, d. 20 Mar. 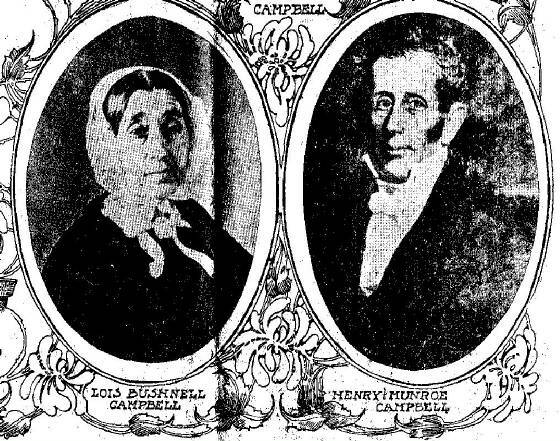 1842. married in Buffalo, N.Y. on 25 Oct. 1812 Lois Bushnell, b. 24 Jan. 1786, d. Detroit, Mich. 19 July 1876. His parents were Elizabeth Cropsey and Thomas Campbell. Henry Monroe Campbell, was a lawyer, judge and captain in the New York state militia from Buffalo, NY, during the war of 1812. While he was away from home fighting the British, Buffalo was taken and his large home with extensive library and family papers, was burned to the ground while his wife Lois and seven children hid in the woods. They moved from Buffalo to Detroit, Mich. in 1826 where he became prominent in legal circles, real estate, and banking. Henry M Campbell founded the Detroit City Bank, the first and largest wildcat bank in the west, which opened in response to a hard currency crisis. The bank failed during the Jackson Panic of 1837. Paying off his debts involved selling his landholdings in Detroit , which included the entirety of what is now Grand Circus Park! Judge Campbell was christened into the Episcopal church in Buffalo, NY, as an adult in 1817, served as first senior warden at St. Paul's Episcopal Church in Detroit from 1827 until his death in 1842. Children: 1. Age 13, Elizabeth Mary Campbell, b. 28 July 1813, d. 16 July 1814. 2. Age 11, Valeria Campbell, b. 21 Apr. 1815, d. 10 Dec. 1895, unm. 3. Age 9, Lois Campbell, b. 25 Mar. 1817, d. Detroit, 25 July 1842. 4. Age 7, Elizabeth Campbell, b. 9 Mar. 1819, d. 9 July 1902, m. 5 Apr. 1856, Samuel Townsend Douglas. 5. Age 5, Henry Munroe Campbell, b. 28 Jan. 1821, d. 1 Sept. 1836, drowned at age 15. 6. Age 3, James Valentine Campbell, b. 25 Feb. 1823, d. Detroit, Mich. 26 Mar. 1890, m. Fort Wayne, Ind. 8 Nov. 1849, Cornelia Hotchkiss, b. Oneida Castle, N.Y. 19 Aug. 1823, d. 2 May 1888. 7. Age 1, Mary Campbell, b. 19 Jan. 1825, d. 16 July 1889, m. William P. Wells, Children, 5; i. William Wells, b. 1858, d. 1862; ii. Mary Ellen Wells, b. 4 Feb. 1863, d. 10 July 1873; iii. Valeria Wells, d.y; iv. Henry Wells, d.y; v. Charles William Wells, b. July 1868.